The germinal matrix is just one of the structures of or associated with hair follicles. The germinal matrix of a hair follicle is sometimes referred to as simply the "matrix" when the context of hair follicles leaves no ambiguity. However, unless the "hair follicle" is stated or is obvious from the context, the term "germinal matrix" (on its own) is unclear because it is used with reference to several regions in the body, e.g. the region of the brain with this name, and the root of the fingernail. 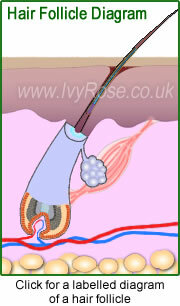 The germinal matrix of a hair follicle is located around the papilla at the base of the bulb of the hair. It is the source of hair growth and is involved in transfering melanin to hair to give it pigmentation. During the active hair growth phase, the cells in the matrix grow quickly and differentiate (by the mitosis process of cell division), causing the hair to grow - i.e. to get longer. The germinal matrix is just one of many structures of or associated with hair follicles. See also the links to pages about other accessory structures of the skin.